Davon Roberts, 33, grew up on Hamilton Avenue. He can be easily described as one of the kids to make it out of the rough 4th Ward. Except, he never left the city. He still lives on Hamilton Avenue. Roberts wants to start a Friday night program to keep young people out of trouble. He says vacant buildings can be converted into youth centers for young people to gather to learn skills and play video games. “Every kid wants to play video games,” said Roberts, who is a trustee and youth leader at St. Luke’s Baptist Church. He said there are scholarships and opportunities available to gamers. He recalls how a program helped him stay out of trouble on Friday nights. A blue van from Bible Baptist Church of Hasbrouck Heights took him and other young people from the neighborhood to the church’s Friday night youth program. “My mother definitely found a way to keep us engaged,” said Roberts, who was involved in after-school programs. He grew up in a single mother household with three siblings. The Friday night program steered him towards college. “I see how that made a huge difference in my life,” said Roberts. Roberts received a bachelor’s in finance from the University of Connecticut and a master’s in business administration (MBA) from University of Hartford. He works as a risk manager for Japanese multinational Ricoh USA. Prior to college, Roberts attended School 6 and Passaic County Technical Institute (PCTI). He is on his third year in earning a law degree from Rutgers University. After school, he did not leave his hometown. Roberts purchased a home in his old neighborhood. “I’m going to make a difference by actually being in these places,” he said. He is running to make a difference not just in his old neighborhood, but the entire city. 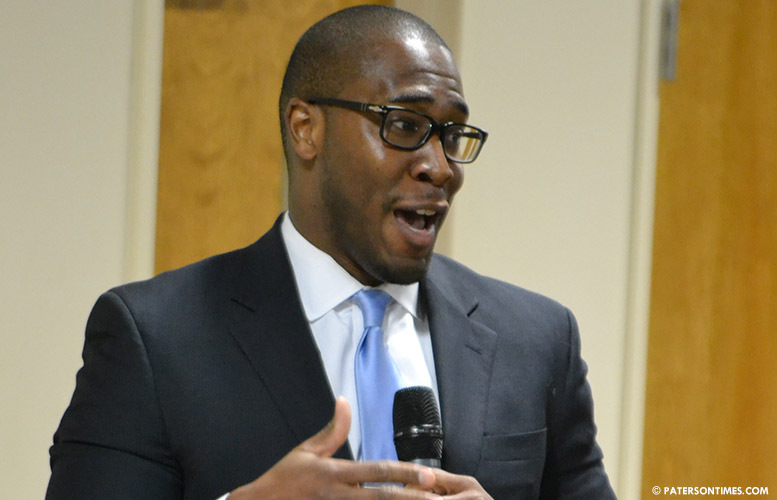 Some of his political positions include expanding the business curfew ordinance which has reduced non-fatal shootings by almost 80-percent in areas designated as hotspots. He has said it makes little sense not to expand it if the data shows the ordinance is working. Roberts favors walking patrol to improve police visibility. He recognized taxes have become overly burdensome and is forcing longtime residents out of the city. “Many residents have already decided to vote with their feet and leave this city in hopes of a safer, cleaner, more affordable, and less frustrating environment,” he said in a debate at City Hall last month. Roberts said the city needs to reduce expenses. He said one way of doing it would be to automate services to reduce head count. “We got to figure out a way to reduce budget or trying to make things more efficient,” said Roberts. He also wants the city to create a portal that allows residents to get access to services and resources being offered by nonprofit organizations. He favors voluntary consolidation of organizations offering the same services to make them more efficient. “Do we need 20 or 30 different entities doing that?” he said referring to feeding the homeless. The city council issues millions of dollars in federal grant funding to social service organizations every year. “We need critical thinkers on the city council,” said Roberts. He views himself as one of those critical thinkers.